May Apples budding in early spring. It was a muddy spring morning. Sophia was probably five. We were the first ones up. We put on our shoes and followed the creek into the woods. It meandered this way and that under large turkey oaks on its way to a wetland filled with reeds and blackberries. The tall dead trees that rose out of the wet ground made perfect homes for cavity dwelling birds like Red-Headed, Downy, Red-Bellied Woodpeckers, as well as Flickers. We called it “Woodpecker Alley”. As we moved deeper into the woods, I showed Sophia the raccoon tracks that looked like tiny handprints in the mud. Deer tracks large and small sinking deep in the muck where everywhere. Sophia took all of this in. 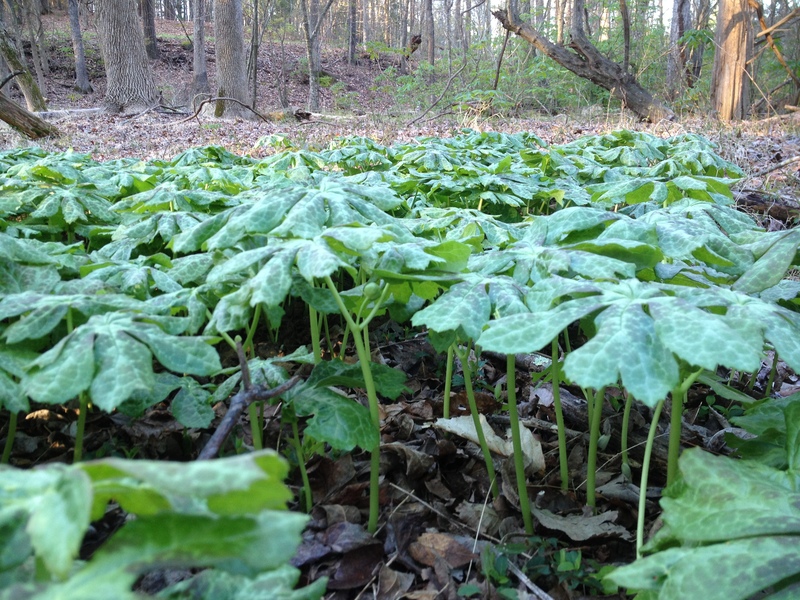 All of a sudden we noticed a long low table of bright green plants growing up together out of the leaf cover on the forest floor. They looked like a gathering of lily pads but growing unsupported and without water. Each lily pad shaped leaf was held up by a slender stalk. Some were twins held up by a Y shaped stalk. Sophia and I scooched down and peered underneath them. We were amazed by what we found. Each Y shaped stalk had a little white flower nodding from a thin delicate stem that grew out of the center of each Y. Had we just walked on by we would have never found the little white flowers. I’d never seen anything like this before. We eventually went back home for breakfast. Dina and little Ralph were up and we told them of our discovery. Years went by and I always wondered what on earth those flowers were. Each spring we’d go back out and locate the same set of plants to make sure they were still there. Finally in the early spring of 2012 I happened to be flipping through the Niche Garden’s catalog and found the same plants! They were called May Apples. I learned all about them, promptly went over to Niche, bought two plants and planted them in the still cold ground. Two male plants grew up that year. Males have no flowers. The next year 4 plants grew, still males though. Then last year 6 plants grew up and 3 of them were female – in the Y pattern. Sure enough each of these had a beautiful little white flower underneath the two leaves. This year 8 grew up and again 3 or 4 of them had white flowers. Each year they add a few more.